Maryland Gov. 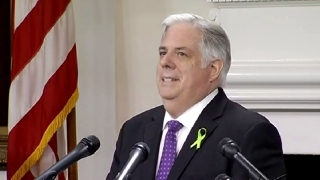 Larry Hogan says he is "still feeling strong" after his second five-day round of chemotherapy. In a Facebook post Thursday night, Hogan said he's happy to be headed back to Annapolis. The governor says he's getting some work done from the hospital and posted a photo that shows him talking on a cellphone with papers spread in front of him on a table. Hogan is being treated at the University of Maryland Medical Center in Baltimore for B-cell non-Hodgkin lymphoma. When he announced the diagnosis June 22, he said the disease was at an advanced stage but his prognosis was good.